The skills of Canterbury Cathedral’s head stonemason, Tony Long, have gained national recognition. Tony, who joined the Cathedral as an apprentice stone mason straight from school in 1986, was selected to receive the Master Craftsman’s Certificate by The Worshipful Company of Masons. 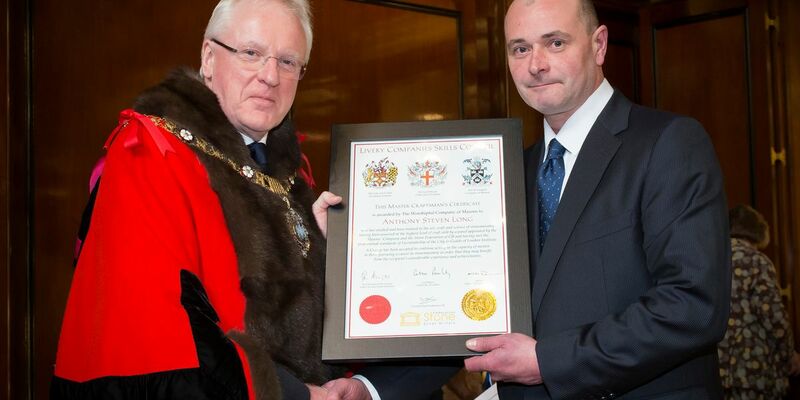 The father of two, who lives in Sturry, Canterbury , was presented with the certificate at a ceremony in the Merchant Taylor’s Hall in London by the city’s Lord Mayor, Dr Andrew Parmley. Tony said: “It’s certainly a day I won’t forget. The award ceremony was quite a formal affair and I really enjoyed the opportunity to talk to other crafts men and women about their work. To be recognised in this way, and alongside some very talented and experienced people, was a real honour. Tony followed his father Peter, a former stonemason and Clerk of Works, into a career at the Cathedral and during his 30 years Tony has been involved in countless Cathedral restoration projects as well as external projects for local churches. The certificate is designed to recognise a recipient’s considerable experience and achievements but also encourages them to act as a mentor to those starting out on a career in stonemasonry. Tony was nominated for the award by the Cathedral’s Head of Conservation, Heather Newton, who received the certificate in 2014.